Thanks to its considerable power, the coil cylinder represents an economical and high-performance solution suitable for use with all types of energy. It has been specifically designed to meet domestic hot water production and storage needs both in the residential and manufacturing sectors. Preheating from a renewable energy source. Heating by a heat generator. Recovery (lower coil) + backup (upper coil). Heating with to coils (for maximum power). Heating possible from any kind of energy. Particularly suited for use with energy recovery (heat pump, cooler unit) and production (solid or gaseous fuel boilers, electric, etc,..) systems. Accelerated heating : coil(s) with large exchange surface area. Significant water storage capacity to meet peaks in demand. Temperature stability for distributed DHW. Water can be stored at a constant temperature of up to 99°C. Less heat generator operating cycles. Cost-effective solution (heating element directly inttegrated into the tank). Quick and easy installation : equipment delivered to site with pre-assembled insulation (for stainless steel cylinders only). Insulation can be easily removed if required. 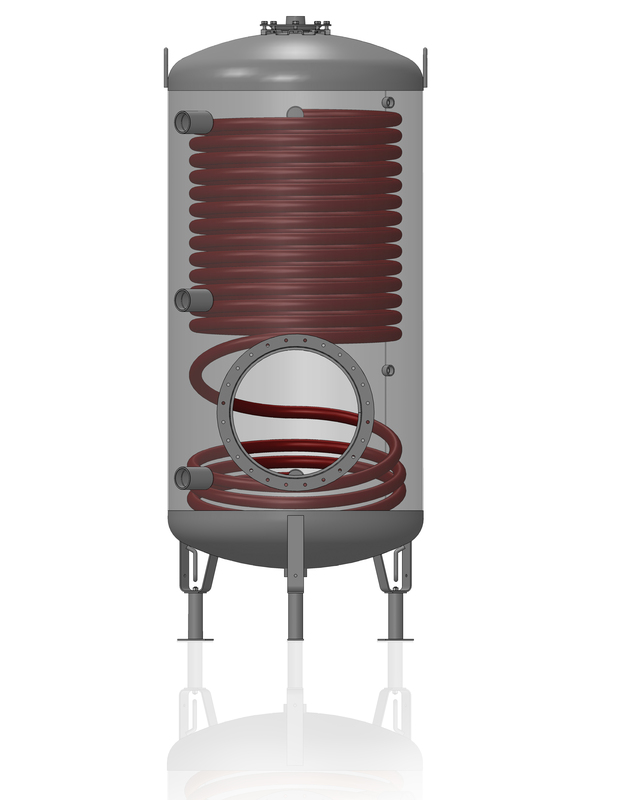 Non-standard version available on request (cylinder with a single heater in the top section upon request). 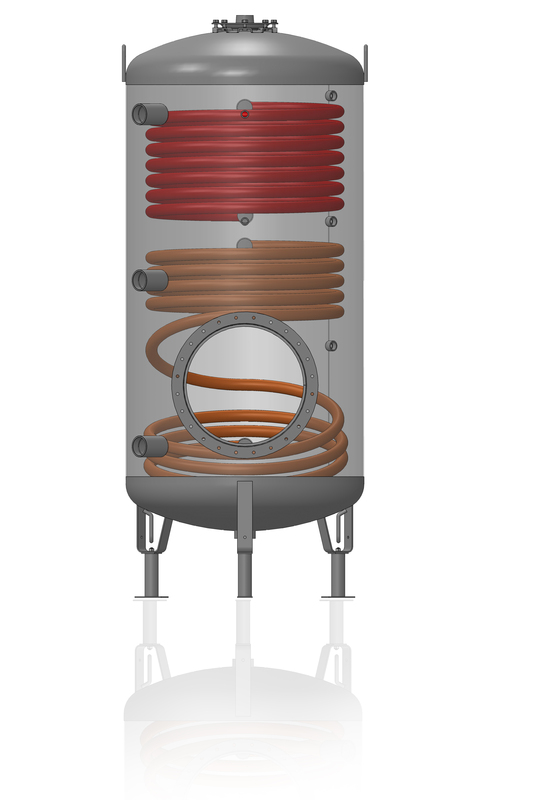 • Vertical enamelled steel tank with 3 feet (in accordance with DIN 4753-3). 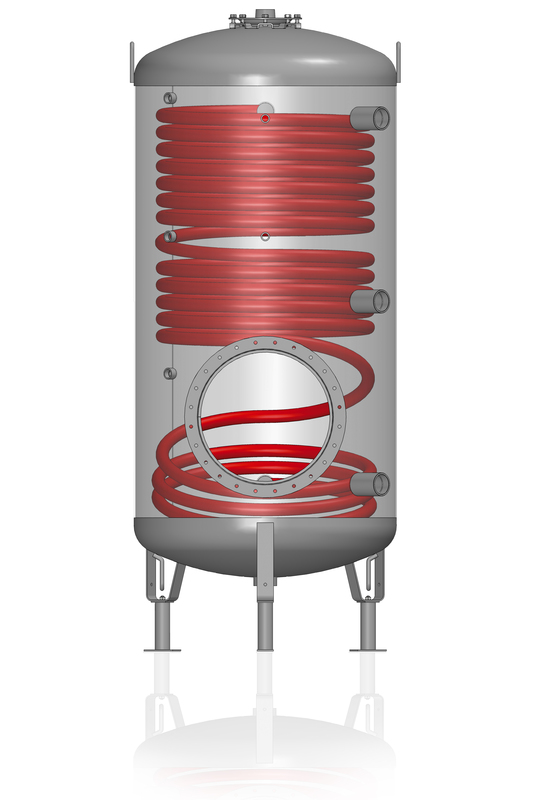 to 2 000L for coil for a heat pump version). • Maximum working pressure = 7 bar – Test pressure = 10,5 bar. • Tappings (in accordance with the following diagram). mm handhole (from 300 to 3000L). • Magnesium protection anodes (2 to 4 according to capacity). • Tank enameled (in accordance with DIN 4753-3). • MS520B Enamel Coating (WT = max 99°C). • Mineral wool – 50 or 100 mm thick + Flexible PVC jacket. • Rockwool – 50 or 100 mm thick – Isoxal metal sheet jacket. Coil exchanger(s) made of enamelled steel. from 3 to 60 kW, depending on the capacity of the tanks. depending on the capacity of the tanks. • Vertical stainless steel AISI 316L tank with 3 feet. • Capacity from 500 to 3 000L. • Maximum working pressure = 7 bar – Test pressure = 10 bar. • Internal and external weldings, stripped and passived. • Maximum temp. = 95°C. (λ = 0,032 W/m/K – 32 kg/m3). • Rockwool – 100 mm thick (λ = 0,034W/m/K – 40 kg/m3). • Isoxal metal sheet jacket. Coil exchanger(s) made of 316 L stainless steel. • One coil placed at the bottom of tank. • Dual coil placed at the top and bottom of tank. – Electrical elements with 825 Incoloy pins. – > 12 kW : 400/700 V three-phase. – > 12 kW : M77. safety thermostat + connected switch). – Electrical power > 20 kW: Double unipolar safety thermostat. • Different thicknesses of insulation available. Obtain a personalized and quantitative study for your project.